Alitalia is running a special 20% discount code on flights from London this weekend. Added to their existing special deals, you end up with some very attractive looking prices. The discount code you need is RED20UK. 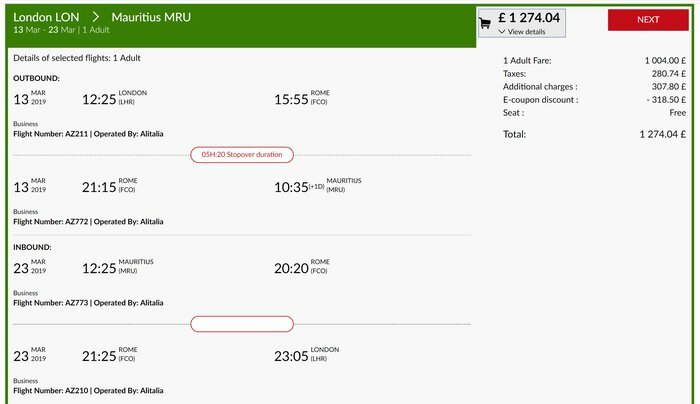 Once you have selected your flights on the Alitalia website you will see a box in the bottom left-hand corner where you can add the code. You must travel between 19th February and 15th April 2019. 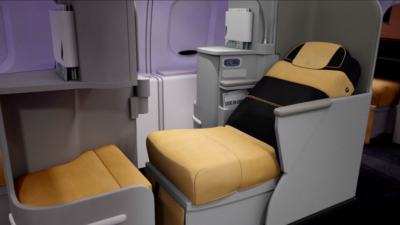 Alitalia is a member of SkyTeam so you will be crediting your flight to Flying Blue, Delta SkyMiles or similar. You can also credit Alitalia flights to Etihad Guest which opens up other options. At the very worst, you can redeem Etihad Guest miles for cash at around 0.6p per mile via PointsPay. You can sign-up for Etihad Guest here, and get 500 miles as a bonus. The Alitalia home page is here. As it happens, I just booked avios return flight to Porto, so I know the BA return fare Friday 1st March to Monday 4th March was priced at £140 when I checked last week. You have to look for flights departing before 28 Feb otherwise it doesn’t work. 10 eur discount is their usual discount if you sign up to their frequent miles programme during booking. 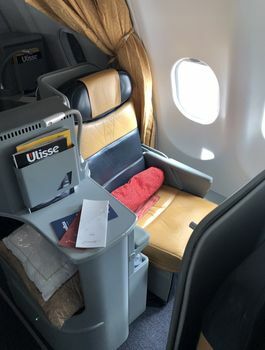 I flew Alitalia business class back from Mauritius two weeks ago (they accepted my ‘upgrade bid’). The A330 seat was good though window seats are definitely better than the middle ones. Even then it’s worth looking for one that has the arm rest next to the aisle instead of the window to stop people accidentally knocking you as they move around the cabin. Perfectly comfortable for the day flight back to Rome though and would fly it again. Looks like a Ryanair seat on steroids! Is it safe to use Alitalia? Maybe I’ve been out the loop, but I thought they were about to go bust? I’ve seen some great fare in the last year..but I was concerned if I flew with them..there was a chance they could go belly up? I don’t think there is much chance of Alitalia (and SAA too) actually going bust and disappearing, as a govt bailout always seems to be the easier political option vs letting a flag carrier with all that heritage prestige etc cease operations. I like Alitalia, done economy long haul and the food was very good, not so surprising though being Italian I guess. Food is good but I’ve seen some woeful attitudes to safety from cabin crew – failures to check seatbelts are fastened, drinking glasses still on tray tables for landing, uniformed but non-working crew chatting loudly during briefings. These things don’t inspire confidence. I’ve seen all this and more on BA, QF and HFP’s beloved QR. If you thought about this a year ago and they are still around, it should be reassuring! At the risk of being chastised, ie this thread is about Alitalia, but some have brought up TAP…..does anybody have any experience regarding the route down to SaoTome from Lisbon with TAP ? My wife is very keen to go down there. Thanks. if you search “flight time from LIS to TMS” google will give you the answer. It makes a stop in ACC and is operated by A320. @Mikeact I have been last year and I am going again in December. Now is actually not good time to go. Late Feb/March/early April is the season with heavy rain. Last year we went via Lisbon and the flight is a bit painful as it is on a short-haul as marcw said. This year we are flying direct to Accra with BA, staying 3 days in Accra to do a short tour before going to Sao Tome on TAP. It’s only 1h30 from ACC to TMS, so that’s manageable in economy. On the way back we are going back on TAP all the way via Lisbon using some of expiring M&M miles. I spoke to one of the agents at TAP as I was trying to select seats without success. He said they will be changing planes to long-haul at some point this year/early next year, so we might get lucky. So much better option is to fly direct to Accra with BA and do a short hop to Sao Tome. You will have to overnight in both directions, but there is a nice new Marriott by the Kotoka airport. They do cash+points redemption ($75 + 12500 points for Junior Suite with lounge access) compared to cash prices of $450+. On Sao Tome, you’ll need to rent a car as you can’t go anywhere without a car. I’d also recommend going to Principe, but avoid Belo Monte as the service and food is terrible. Let me know if you’d like further info and I’ll post here. It’s in my top 3 destinations. I did a very similar bunch of AZ business class long-weekend trips this time last year: LHR-SCL (B77W), LHR-GIG (A332) and LHR-EZE (B77W, returned in an older B77W with very small & low-res PTV) all via FCO. Not quite this cheap previously. But the flights were all good (comfy seats always next to a window, OK but indifferent crew, good food and no delays). The AZ lounge near gate 42 was nice and not been back to FCO to try the new lounge near gate E11. Would happily fly AZ long-haul J again and if this was advertised eariler would have booked my LHR-NRT with AZ, but already booked with KE.